A nine-year effort to restore and protect the Pine Bend Bluffs Natural Area took the annual Minnesota Environmental Award for Natural Resource Protection at a ceremony May 17. FMR and numerous partners have helped protect and restore hundreds of acres of this site, which offers spectacular views and biological diversity along the Mississippi. About 250 of Minnesotas environmental and corporate leaders were in attendance at the awards ceremony and dinner. FMR conservation director Tom Lewanski accepted the award on behalf of the partners, many of whom were also there. 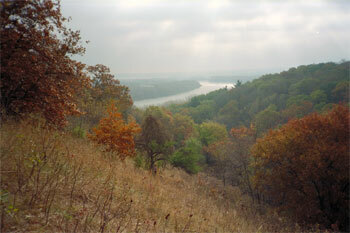 Permanent protection for 256 acres within the DNR Pine Bend Bluffs Scientific and Natural Area. The SNA program provides the highest level of state protection available and is reserved for the highest quality natural area remnants. Ecological resource management plans for about 800 acres of the natural area. Intensive ecological restoration work on over 160 acres, with more planned. Restored plant communities include wetland, oak savanna, sand-gravel prairie, mesic prairie, and mesic oak forest. Over 800 volunteers have participated in over 20 restoration events at the natural area since 1999, representing well over 2,500 hours of labor. Volunteers have removed, stacked, and burned exotic brush, removed other exotic plants, installed and transplanted wetland and prairie plants, collected and broadcast native prairie seed, and planted acorns. FMR has been the project lead, initiating the first steps of landowner outreach, engaging partners, developing ecological management plans, conducting landowner outreach, leading restoration efforts, organizing volunteer events, and providing funding. Among the many government and private partners involved in the protection and restoration of the natural area are the DNRs Metro Greenways and Ecological Services programs, the Dakota County Farmland and Natural Area Program, Dakota County Parks Department, Flint Hills Resources (a landowner in the area), Great River Greening, the Trust for Public Land, the city of Inver Grove Heights, Macalester College, the Dakota County Soil and Water Conservation District, National Fish and Wildlife Foundation, Mississippi River Fund, Mississippi National River and Recreation Area, and the Legislative Commission on Minnesota Resources. FMRs commitment to the natural area, Lewanski says, is firm. We didnt just come in to help with restoration and then leave. Were interested in keeping long-term relationships with the landowners and the land. Now its 14th year, the Environmental Initiative Awards is one of the most popular environmental awards programs in Minnesota. The program annually recognizes 15 innovative partnerships around the state. For information about the award finalists, please visit the Minnesota Environmental Initiatives Finalists page.